Below we highlight research demonstrating the benefits of the focused approach provided by concentrated funds. We examine the differentiating features of concentrated portfolios, their lower correlation compared to the overall market and their role in a diversified portfolio as a complement to a broad-based equity portfolio. A concentrated equity portfolio is distinct from other mutual funds in that it is generally focused on a portfolio manager’s “best ideas.” The following outlines the significant differences that result from holding fewer stock positions. A concentrated fund with 50 stocks allocates 2% to each position. A fund with 200 stocks allocates 0.5% to each position. In “rounding out” the portfolio, it has been assumed that only a fund with a larger number of holdings can be fully diversified and, therefore, less volatile. 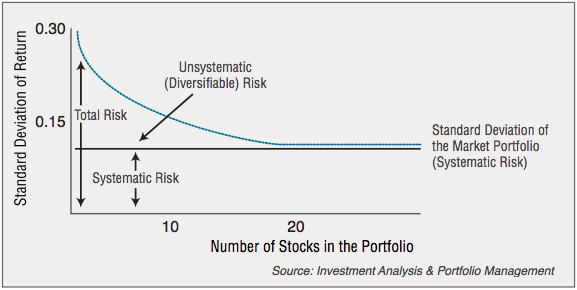 Yet research shows diversification can also be obtained with a much smaller number of stocks. Finance textbook Investment Analysis & Portfolio Management highlighted the classic 1968 findings of John Evans and Stephen Archer along with Thomas Tole’s 1982 research which demonstrated that “90 percent of the maximum benefit of diversification [was] derived from portfolios of 12 to 18 stocks.” Further, as the number of holdings increased to approximately 20, a gradual reduction in portfolio risk occurs. As a result, concentrated funds have been found to offer approximately the same level of portfolio risk as funds with twice the number of holdings. With risk being relatively the same as broad-based funds, several research studies have found that a noticeable benefit of concentrated funds is outperformance. Below highlights a few of these studies. The term “active share,” introduced in 2006 by academics Martijn Cremers and Antti Petajisto, represents a mutual fund’s share of portfolio holdings that differ from the holdings of its benchmark index. A fund can have an active share from 0 to 100: An index fund that mirrors the holdings of its benchmark would score 0, while a fund with no holdings that overlap those in the benchmark index would have an active share of 100. In fact, deviating from the benchmark index has historically been relevant to adding alpha, as Cremers and Petajisto found that the funds with the highest active share exhibited strong outperformance. Importantly, among these active stock pickers were focused funds, as the study also found that concentrated funds tend to have a high active share. Additional research has found that concentrated funds made of managers’ “best ideas” have added value above the benchmark index. Cohen, Polk and Silli, researchers previously mentioned earlier in this paper, used “four tilt measures” to identify best positions and found that concentrated U.S. positions outperformed the market by a range of 1% to 2.5% per quarter from January 1984 through December 2007. These “best ideas” have also outperformed other stocks in the portfolio that held smaller weightings. Researchers from Emory University, Klaas P. Baks, Jeffrey A. Busse, and T. Clifton Green, agree that there is a positive relationship between performance and a manager’s conviction in their best ideas. As stated in their paper, “Fund Managers Who Take Big Bets: Skilled or Overconfident?” they found “focused managers outperform precisely because their big bets outperform the top holdings of more diversified funds.”5 Analyzing actively managed U.S. domestic equity funds, they focused on a stock’s position in the portfolio as a measure of the fund manager’s level of optimism relative to other securities. Based largely on the portfolio holdings and managers’ willingness to “take big bets in a relatively small number of stocks,” they determined that concentrated managers outperformed their non-concentrated counterparts by about 4% annually. According to Danny Yeung, Paolo Pellizzari, Ron Bird and Sazali Abidin, concentrated funds can offer outsized returns with similar risk as measured by standard deviation.6 The researchers from The Paul Woolley Centre for the Study of Capital Market Dysfunctionality at the University of Technology, Sydney examined how portfolio managers would have performed if the funds were more concentrated in the stocks in which they had the most conviction. High conviction portfolios are made of the portfolio managers’ best ideas. Generally when the managers are limited to selecting fewer holdings, the portfolio does not get diluted by marginal stocks, i.e., stocks that they are less enthused about. Rather, with fewer holdings, portfolio managers can better focus on those stocks in which they hold a high conviction. These best ideas can be purchased, held and thoroughly understood. They can more easily gain a deeper knowledge of these companies, getting to know the management team of each company, understand their capital structure and deployment, participate in manager calls and read financial reports. With a deep understanding of the company, portfolio managers can take a longer term view to allow the firm the time to implement and achieve its goals. More patience is gained and the manager tends to be less likely to sell shares during periods of short-term disappointments. This strategy tends to result in lower portfolio turnover and potentially lower capital gains distributions for investors. Within a concentrated portfolio, stocks may not be closely followed by Wall Street research. As a result, a “best ideas” portfolio is likely to have a lower correlation to a broadbased equity portfolio or an index fund that tracks the overall market. 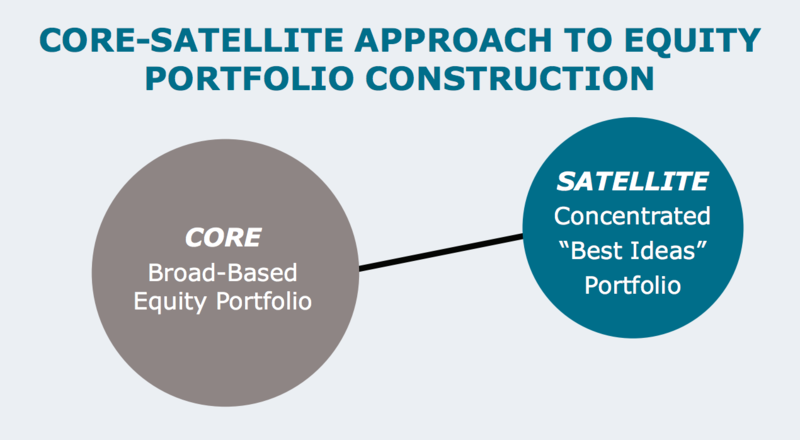 In a core-satellite approach to portfolio construction, this lower correlation makes a concentrated fund an ideal candidate as a satellite position, as it can be viewed as complementary to core equity portfolios. The Value Line Larger Companies Focused Fund (VALLX/ VLLIX) holds approximately 30 to 50 stocks to represent a streamlined approach to accomplish the Fund’s objective of capital growth. By owning fewer securities, more capital can be allocated to the “best ideas” in the large-cap growth universe. Investing in a more concentrated portfolio enables the manager to focus on a select number of high quality growth companies that appear to have the most attractive growth prospects commensurate with risk. The result is a diversified, high conviction portfolio with the potential to deliver attractive returns over time relative to the S&P 500 Index, the Fund’s benchmark. Likewise, the Value Line Mid Cap Focused Fund (VLIFX/VLMIX) limits its holdings, with the number ranging from 30 to 50. The investment objective of providing long-term growth of capital in primarily mid-cap stocks remains the same. With fewer holdings, portfolio diversification is maintained and there is little-to-no dilution from stocks with less potential growth. With a longer-term investment view and holding period, these Funds may experience short-term periods of both relative outperformance and underperformance. However, over time, the more concentrated, “best ideas” portfolios may have the potential to provide superior levels of capital appreciation for investors with a long time horizon. Cohen, Randolph B. and Polk, Christopher and Silli, Bernhard. “Best Ideas,” March 15, 2010. Available at SSRN: http://ssrn.com/abstract=1364827. Reilly, Frank K. and Brown, Keith C.Investment Analysis & Portfolio Management, 10th Edition.2010. Cremers, Martijn and Petajisto, Antti. “How Active Is Your Fund Manager? A New Measure That Predicts Performance,” AFA 2007 Chicago Meetings Paper March 31, 2009. Petajisto, Antti. “Active Share and Mutual Fund Performance,” CFA Institute Financial Analysts Journal, Volume 69, Number 4, 2013. Baks, Klaas P. and Busse, Jeffery A. and Green, T. Clifton. “Fund Managers Who Take Big Bets: Skilled or Overconfident,” March 2006. Yeung, Danny and Pellizzari, Paolo and Bird, Ron and Abidin, Sazali. “Diversification versus Concentration ... and the Winner is?” The Paul Woolley Centre for the Study of Capital Market Dysfunctionality, UTS, Working Paper Series 18.
including the risk of price fluctuations. The S&P 500 Index consists of 500 stocks traded on the New York Stock Exchange, American Stock Exchange and the NASDAQ National Market System and is representative of the broad stock market. This is an unmanaged index and does not reflect charges, expenses or taxes, and it is not possible to directly invest in this index. performance is no guarantee of future results. Value Line, Value Line Logo, Timeliness, Safety are trademarks or registered trademarks of Value Line Inc.
and/or its affiliates in the United States and other countries. Used by permission.